While we were all in Los Angeles I did basic enameling with the girls. While using a torch is a bit scary they all did GREAT. I need to take some photos of their pieces to show you. But here are some pictures of the crew at work! Laura just prepped a piece and is getting ready to torch I think. And I think this is Emily holding her recently enameled frog? Thank you it Art Unraveled 2008 and Richard for getting me hooked again. All of them LOVED it I think. Ok – so blogging everyday – not going to work for me. Maybe I need to try to blog once a week for a goal for the month of September. Well actually I think I best blog every day this WEEK and then for September/October I better try blogging once a week. August was a great month! First Art Unraveled in Phoenix and then a week with my nieces in L.A. So lets start with my most recent adventures. Los Angeles Garment District- been forever since I have done this. I took three teenagers clothes shopping in downtown L.A. I will need to put up a few of the outfits we found. Oh and the FIDSA Scholorship store in their complex (which is a few blocks outside of the fashion district) was great. I wish I had a photo of Laura in the to die for red raincoat – a steal at $8. Emily is after my own heart – when she found the cutest dance dress for $5 – well who could not buy it? Even Suzanne found things there. Oh and this is the building where Project Runway is being done this year!!!! Woohoo!!!!! Wish that 1) I had known that and 2) that they put the poor designers from the show in a glass enclosed design studio so we could all watch when we were there. It seems I will be writing in weird order on this. Comes with when I have photos to go with the stories (excluding this one). Thus the shopping day in Phoenix is posted and a trip to Dairy Queen in L.A. also. What is it about Dairy Queen? So it seems the girls are addicted to Dairy Queen – something about their not being any in Houston and its like their dad’s favorite place growing up. So they wanted to do Dairy Queen everyday. They even got Nana and Papa to go although not this day. This is a brownie sundae (with oreos maybe?) – modeled by Suzanne. Oh and note the cute dress and purse – a couple of the purchases in the Garment District! Art Unraveled – Shopping day! Friday was my SHOPPING DAY!!!! I only went to two places because if there is one place HOTTER than Vegas its Phoenix. Plus they had HUMIDITY. Ugh. The storm finally broke the day AFTER I left town of course, so the whole time it was way too hot. And Las Vegas – well we were having 90 degree weather while I was in Phoenix. There is just something so WRONG about that! But this isn’t about the weather (although it comes up again later) so first stop was SAS! First off – good news (for me). SAS had a fire last year and when they rebuilt – they put in AIR CONDITIONING! I had put SAS as my first stop because with ….pumps versus air conditioning – well they don’t work well in humidity so I figured I best do this stop while it might be below 100 degrees. SAS – hard to describe but fun to shop…this year I stuck to TRIMS and LACES. And I stuck to DEALS. So these trim cards – $2 for the CARD. Yes you heard me right. 10 cards so $20…how could I turn that down? This place is a huge wearhouse FILLED with fabrics and trims and such. But I don’t NEED anything right now and I DO NOT have a warehouse to STORE things in so – trims and laces were what I got. Actually I needed something like a chenille in white for a project I wanted to work on while in Phoenix but all I was able to find was burlap (haveI mentioned I have a thing lately for burlap? Have you seen SILK burlap? Oh so nice looking and to feel.) Now this burlap is NOT silk – just plain burlap like. I even looked at wool but it was too hot to buy wool. Then I went to a new quilt store called 3DudesQuilting I had not picked a quilt store to check out so I googled Phoenix quilt stores (because I (thought I ) needed batting for a project while there) And I thought they might have the chenille I was looking for (oh found that at The Cotton Shop in Redondo Beach CA on my next adventure!). So why did I pick this quilt store? Well my luck was great – they were having their grand opening event and if you printed out their coupon and brought it you had 40% off EVERYTHING you bought at that time – good for a one time purchase. Ok – me and a quilt store and a coupon? Dangerous!!! The funny thing – their Air Conditioning was broke. I should have REVERSED the order of shopping. Great store, great deal, great staff. Really made me wish I lived closer. Sounds like the kind of quilt store you want around the corner. And they were so apologetic about the AC like they had anything to do with it. And a fridge full of water for all of us. Yes by the time I left they had quite a crowd. Ok – I have been able to AVERAGE one post a day since Feb 1! Never thought I could keep up this pace, whew! Of course many other things are not done. Hmm….ah well. Now to decide what color scheme…I can’t copy EXACTLY GeorigiaPeachez, lol. 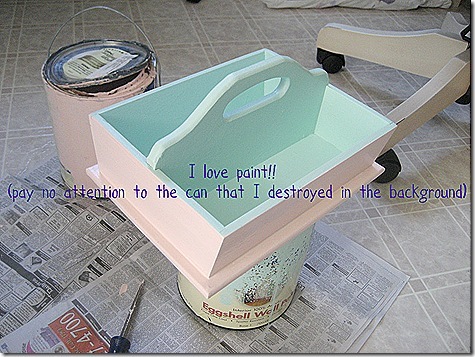 She is so nice – said to hit the local Lowes or Home Depot and look at the abandoned colors in the paint area. My exchange package from Wanda – WOW!!! Wow Wanda – you managed to “make” all things didn’t you? And in pink tones with all trims and such in green! First I love the cupcake pan done in pink – duh!!! I use those things for sorting all the time and mine are all the plain ordinary silvertone. PAINT them – brilliant. And then fill them with great things. Nope haven’t unwrapped/unwound all these great items yet. You really loaded me on my fav color of green too! Thank you. The heart with the silhouttes – yep I am addicted lately to silhouettes. And finally the clothes pins painted pink – I have a thing for clothes pins, lol. And you rolled them with more versions of green trims! Great exchange! Hope you liked my package also! I had signed up for a great ezine this time – Cupids workshop by Lisa Pace. Its done but such good ideas. This is just one of them! This is my interpretation of the heart pockets. Lisa’s is beautiful but since I am shipping mine I left off the paper flowers she glued on. Also I want mine to last a LONG time so no glue in the process for me (although there are some really good fabric glues out there that should work too) so I hand embroidered (did the big letters with chain stitch, the little with split stitch) the words and machine sewed my hearts together. For the machine sewing I used a double stitch and I used another Superior Thread that is varigated. These are STUFFED now with candy hearts (ok dove chocolate and Reeces hearts) and iTune cards. (Teenage girls are very easy to shop for I think – they ALWAYS want itune cards for instance.) So – that is why they are somewhat odd shaped? And hopefully you can see the HEART shaped button on Suzanne’s heart (for sweet HEART, get it?). Also I lucked out at some point and found a victorican scroll rotary blade by Fiskers. I used that to cut the inside heart. I didn’t ant to try to work the outside heart to match so I just cut those plain. Lisa used pinking shears on both hers – and its beautiful but I like rotary cutters and can’t figure out where my pinking blade is at the moment. So this worked out well I think. Lisa did the hand embroidery on hers – in the same color tone as the heart itself so it was hard to see the word. I did my embroidery floss to match the back heart instead (did the big letters with chain stitch, the little with split stitch). Also rather than just the word LOVE on mine I chose to pick a word with the same first letter as each niece. Easy for Laura – Love. 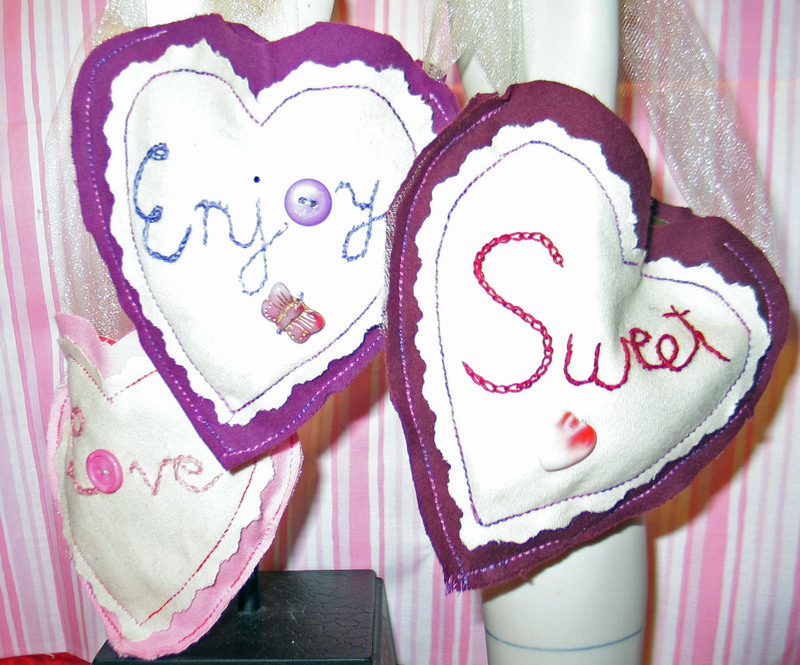 Came up with Sweetheart for Suzanne and by replacing the heart word with a button heart I figure it works. For Emily – well thats a tough one so I went with Enjoy! The backs have a similar button on them for each. Can’t have those plain right? Heart pockets – round 2! Have you seen the new blog by Moda designers? Ok so I have resisted the Moda pre-cut strips and squares. Well with this they have hooked me! Its nice to see these ideas PUBLISHED. and I love things that hook over door handles – reminds me of May Day baskets we used to hang when I was very young on neighbor’s doors. I used the heart yo yo from Clover instead of a regular round yo-yo…just liked it better. Also I bought valentine ribbon with words on it at Michaels and either doubled it or lined it with a satin ribbon. Sela’s is a cute pink and brown ribbon that says Happy Valentines Day. Jackson’s says hugs & kisses. Eli’s says Love. And rather than have the 3 pearl drops I went with photos in soldered glass for the bottom of the holders – just in case their parents (my B and SIL) don’t know who’s is whose. And then I did a heart game of tic tac toe! So cute and SIMPLE. Found this idea at Make and Takes. But I cut my heart out of felt and used a great rotary cutting blade that is called victorian edge. The package arrived today so I can release this write up!!!! So, my partner was Wanda! This time I actually PHOTO’d what I sent. I never do and I ask for photos but never seem to get them from my swap partners. I try always to post what I get (at least part) so they can get photos if they need them. But I know I don’t always remember either so I thought this time I would actually PHOTO them myself! Items in this photo – two fabric pieces – I went patriotic since Wanda’s husband is in the US Army! The left fabric is a repro of an 1800 type fabric, although I thin the modern designers/printers chose different colors! The second fabric is now, while not vintage, getting there? Its probably 20 years old. Isn’t that boy cute on it? Next to it is a bell shaped candle holder…there is a battery operated light down in there (see the red?) and its covered with creme and pink heart shaped macaroni! Looks pretty cool in person, lol. Its sitting on a home made doillie (not by me). Next to that is a silicone heart cake pan – love those things…the cake pops right out so you can frost the sides even! In it is the scrap from sequin punching (silver roll), and two baseball cap pencil sharpeners and a “make two bouncing balls” kit. 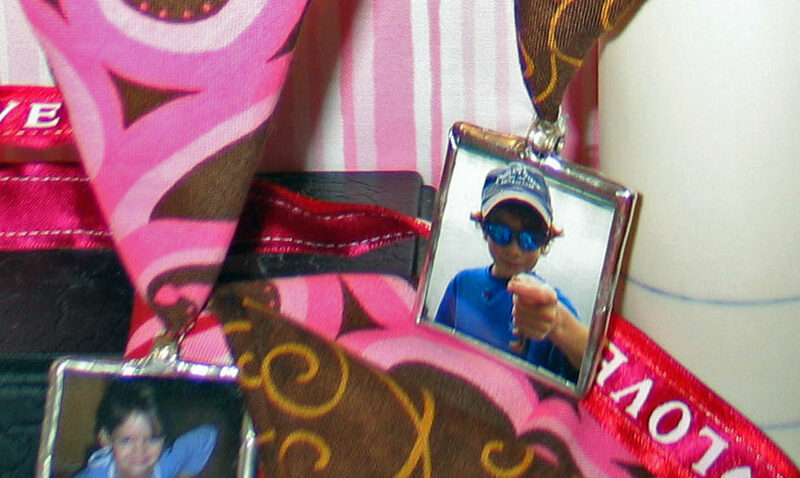 The later tow items are meant for the boys’ door hangers. The additions to this photo are the crayon erasers, and the three heart tins. I just love crayons in odd shapes! And to get six different colors, well I could not pass those up! In the heart tins – the bottom one has three vintage buttons, including two great face buttons (like betty boop), and a yellow rose. The upper left tin has some spring type buttons/beads in the shapes of flowers, fruit, leaves – these are modern and plastic. The upper right tin has some plastic modern pieces that might be in a cracker box? The final three items (minus the chocolate packing material – for the boys door hangers again) are the t-shirt for the youngest (I silkscreened that one! ), the button wreath/frame (I made that also! ), and the crepe paper letters and number packs on the left side. And I wrote an explanation and included it in the BOX!!! Can you imagine? I can’t – I normally write it up afterwards and email it with a header like – don’t read until package arrives! Of course I forgot to mention that I painted the airplane, or the valentine picks at all. Ah well – overall I did pretty good on this one! This is what I made today. Ok – so this was not ALL I made, but all that is completed as I type this. 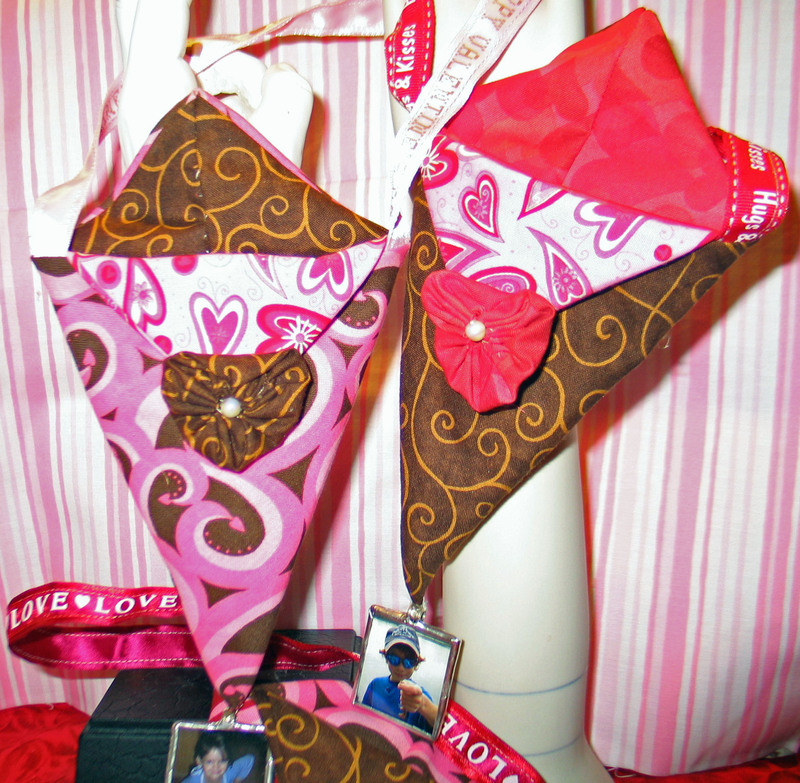 Working on more valentine packages – this time for nephews and nieces! Hopefully to be mailed on Tuesday.